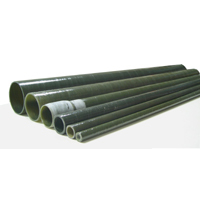 Goodwill machine-made reinfored thermosetting resin pipe is manufactured by filament winging process, which meets the requirement of CNS11646 and ASTM D2310, D2996 etc. It has advantages such as abrasion and corrosion resistant, insulation, light weight and economical. Address: No. 9, Lane 119, Hsinsheng N. Rd. Sec. 2, Taipei, 104 Taiwan, R.O.C.